Hollybeary Creations : Season's Greetings..
Hi everyone.. I hope your week is going well. 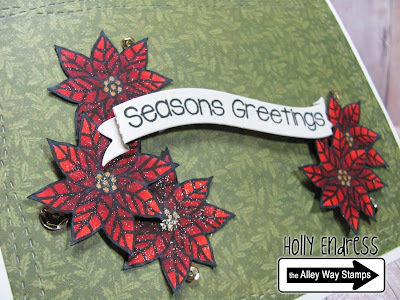 Today I have a Christmas Card using one of the new sets from the Alley Way Stamps called Mistletoe Kisses. I die cut a piece of patter paper that was on my desk using the Wonky stitches die from Avery Elle and then I added it to a Vanilla card base. 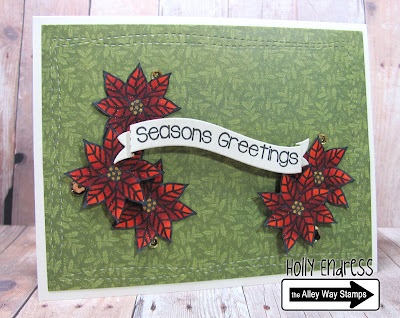 I stamped the poinsettia image several times on a piece of White card stock and colored it in with Copics and cut it out. I also added some Red and Gold Wink of Stella to the them as well for some Shimmer.. If you enlarge the photo above you can see the shimmer better. I stamped the sentiment onto a banner I die cut from a scrap of pattern paper on my desk. I added the flowers using some glue and dimensionals. For an added shine I added a few Gold sequins from Pretty Pink Posh around the Poinsettias. 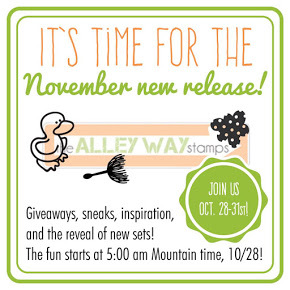 Head over to the Alley Way Stamps blog for more inspiration!! Lovely card, Holly! The poinsettias are full of glittery goodness.